ACTOR Chris Alexander is swapping New York for New Street, in Paisley to take the role of the Dame in this year’s PACE panto, Snowhite. 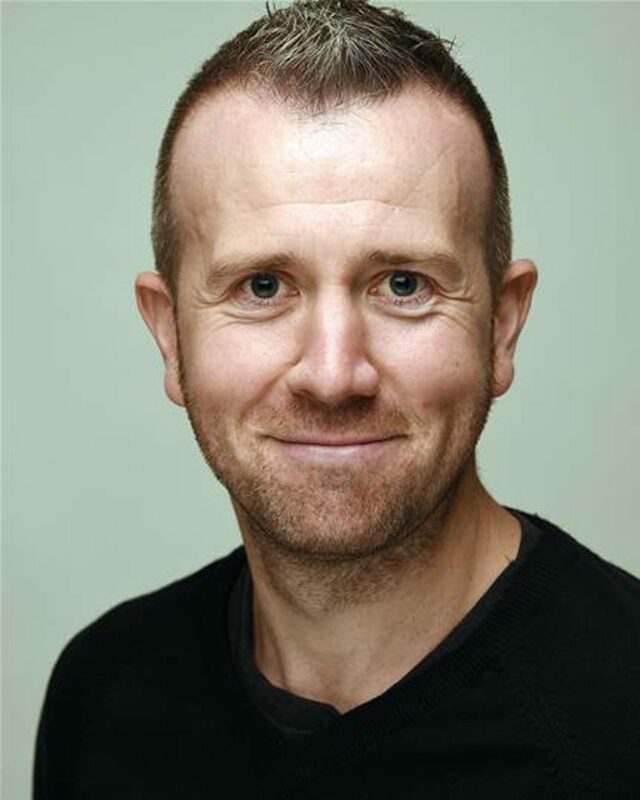 Scots-born Chris performed in New York as part of Ramesh Meyyappan’s production of Butterfly, which was part of the Brits Off Broadway Festival, at the 59E59 Theatre, in Manhattan, last year. And earlier this year, Chris was back in the USA with the same production – an adaptation of Madame Butterfly – staged in Millersville, Pennsylvania. But the Paisley Arts Centre, in New Street will be Chris’s stage from November 25 until December 30 when he stars in the Snowhite panto. Also appearing in the panto, written and directed by Ross Stenhouse are professional actors Chloe Lupton, as Snowhite; Dani Heron, as the Evil Queen; Danny Holmes, as The Prince and Nathan Byrne, taking the comic lead. And of course, there will also be 100 local youngsters who are members of PACE, taking part in the hilarious adaptation of the traditional panto. Tickets only recently went on sale and already more than half the seats have been snapped up. The show is produced by PACE panto stalwart, Alan Orr who also takes on the role of musical director. Alan said: “Everyone at PACE is working their socks off to make this the biggest and best panto we’ve ever done. “We’ll be performing a magical, fun-filled family show with laughter every step of the way and loads of audience participation. Tickets, priced from £9.50p are available from the Arts Centre Box Office, by logging on towww.boxoffice.renfrewshire.gov.uk or by calling 0300 300 1210. A sell–out crowd of 500 people watched 16 awards presented at the ROCCO’s on Friday 18th Nov at the Normandy Hotel, Renfrew – the annual business awards of Renfrewshire Chamber. The area’s premier business event, now in its thirteenth year was sponsored by Paisley 2021 for UK City of Culture. Chamber President Audrey Cumberford (Chief exec & Principal of West College Scotland) gave a warm welcome to the audience and highlighted the chambers successes in the last 12 months. She emphasised the opportunity for Renfrewshire with record investment planned via the Glasgow City Region City Deal and the potential of winning the City of Culture bid. Council Leader Mark Macmillan gave the main sponsor address and urged companies and individuals alike to hit the “back the bid” button via the 2021 website. Paisley’s own megastar Paolo Nutini had a video message for the audience to encourage their support and the difference culture can make for young people was highlighted by Street Stuff’s Ben Milne & Mark Kerr. Rocco favourite Fred MacAulay hosted and was impressed by the performances of 3 piece girl group Loxi, Singer Lisa Kowalski and an energetic 2021 themed piece by Pace Theatre Co. The ROCCO raffle raised £8,000 for local charities and good causes with St Vincent’s Hospice and Street Stuff Culture Bus Project the main charities of the year. One of Paisley’s favourite musical daughters is returning to the town to play this year’s Spree festival…and she’s bringing some friends with her. Carol Laula will open The Spree festival on Friday 14 October with a very special ‘celebration of Paisley’ in a Spiegeltent in the town’s County Square. The festival, now in its fifth year, will run from 14-22 October with music, comedy, drama, film and kids activities programmed throughout its nine-day run. Appearing with Carol in her show will be ex-River City star Tom Urie; David Scott (formerly of The Pearlfishers and BMX Bandits); Mark and Claire Rafferty, relatives of the legendary Gerry Rafferty; and Carol’s core backing band, which boasts a wealth of Scottish talent. Special guest appearances on the night from PACE Youth Theatre Company and St Mirren Football Club promise to make the show a unique celebration of Paisley. Carol said: “I am beyond delighted and excited to have been commissioned to put on a show for the opening night of the Spree festival. “The remit is to celebrate all things Paisley. Easy-peasy… but where do I start? Tickets for the show are available to buy online from www.thespree.co.uk; from the Box Office on 0300 300 1210; or in person from Paisley Arts Centre or the InCube Shop at 9b Gilmour Street. Other acts appearing at the festival include Admiral Fallow, Donnie Munro, Treacherous Orchestra, Skerryvore, Roddy Woomble, Daniel Sloss and Craig Hill. The Spree is supported by Saporito and Birra Moretti. A delegation representing Paisley’s bid for UK City of Culture 2021 met with an audience of parliamentarians, business leaders, media and key cultural figures in the House of Commons today (Tuesday 6 September). Members of the Paisley 2021 bid team, accompanied by a group from PACE Youth Theatre, joined Renfrewshire MPs, Mhairi Black and Gavin Newlands, in hosting a celebration of Paisley – Scotland’s largest town, at Westminster. A large audience were treated to a performance from PACE and listened to speakers detail the strength of Paisley’s bid and the town’s drive for UK City of Culture 2021. The group, led by Renfrewshire Council Leader and Chair of the Paisley 2021 Partnership Board, Mark Macmillan, and Paisley 2021 Bid Director, Jean Cameron, are the first delegation representing any of the locations bidding for the UK City of Culture accolade – run by the UK Government’s Department of Culture, Media and Sport, to hold such an event at the House of Commons. Town leaders believe that the bid for UK City of Culture 2021 will help to transform Paisley future by using its unique cultural heritage as the home of the Paisley Pattern and one-time centre of the global textile industry, to attract tourism investment as well as promote further job growth and economic stability across all of Renfrewshire. The bid will harness the power of culture to tackle deep-rooted poverty in communities identified as the most deprived in Scotland, and will place the artistic community at the heart of the town’s cultural, social and economic transformation. There is already widespread grass roots support for the bid. The bid is just one part of Renfrewshire Council’s plans for the wider regeneration of Paisley and Renfrewshire, including the £56.7m refurbishment of Paisley Museum and a number of projects being delivered as part of the Glasgow City Region City Deal – worth £274m to Renfrewshire. Jean Cameron, Bid Director for Paisley 2021, said: “The opportunity to bid for the UK City of Culture title in 2021 has ignited a new conversation about Paisley and we are seeing a real surge in support for our bid, highlighted by the level of interest shown in our story in London. Councillor Mark Macmillan, Leader of Renfrewshire Council, said: “Paisley and its surrounding areas, like many towns and cities, has challenges to face but we are confident that we can tackle those head on. The Department for Culture, Media and Sport has tended to award UK City of Culture status to a place which has a clear plan to use the title to transform its fortunes – there is a proven link between culture and well-being and we want to use the power of that to make people’s lives better. “Paisley has much to offer and there are few places of similar size with the same depth of tradition, heritage, talent and passion for improvement. Renfrewshire MPs Mhairi Black and Gavin Newlands were joint hosts of the event which took place in the Strangers’ Dining Room in the House of Commons. Bids are expected to be lodged with the UK Government’s Department for Culture, Media and Sport in Spring 2017, with the winner announced in Autumn 2017. A group of eight young people from Paisley’s PACE Youth Theatre are on their way to London to wow Westminster as part of Paisley’s bid for UK City of Culture 2021. The group set off on their way today (Tuesday 6th September), making the first leg of their journey in the official Paisley 2021 taxi. The young performers will accompany Renfrewshire Council Leader and Chair of the 2021 Partnership Board, Mark Macmillan, and Bid Director, Jean Cameron, to a special reception at the House of Commons, attended by parliamentarians, business leaders and key cultural figures. Hosted by Renfrewshire MPs Mhairi Black and Gavin Newlands, the event will promote Paisley’s Untold Story and showcase the strength of Paisley’s bid for UK City of Culture 2021. The group from PACE, the youth theatre which started the careers of Paolo Nutini, James McAvoy, and new star of Hollyoaks Amy Conachan, among many others, will put on a specially commissioned performance that will tell Paisley’s story and share what makes the town – Scotland’s largest, so special. Paisley’s bid and journey to 2021 will harness the power of culture to tackle deep-rooted poverty in communities identified as the most deprived in Scotland, and will place the artistic community at the heart of the town’s cultural, social and economic transformation. The bid will celebrate the town’s internationally significant cultural and textile heritage, home to the world famous Paisley Pattern and one of the UK’s original creative industries – thread making and weaving, and will be used to attract tourism investment as well as promote further job growth and economic stability across all of Renfrewshire. The Paisley delegation is the first representing any of the locations bidding for the UK City of Culture title to hold such an event at the House of Commons. Thousands of people turned out for 16 cultural events across Renfrewshire, held as part of the Paisley 2021 Weekend. Held on Saturday 20th and Sunday 21st August, the Paisley 2021 Weekend brought together diverse cultural events taking place all over Renfrewshire in support of Paisley’s bid to be UK City of Culture 2021. The cultural extravaganza showcased the broad depth and range of cultural activity which flourishes across the region throughout the year. Locals and visitors were spoiled for choice over both days, with live music, open-mic sessions, dance performances, gala days, an Afro-Caribbean carnival and the increasingly famous Pride of Paisley lions just some of the offering which took place. Highlights included the culmination of Paisley Music Week, with an impromptu performance by Paolo Nutini surprising unsuspecting gig goers at The Cave. The star treated the crowd to a rendition of his hit, Pencil Full of Lead, to show support for Paisley Music Week and the Paisley 2021 Weekend. Local boy Tom Potter, UK Young Drummer of the Year, had County Square shaking and rocking when he took centre stage at the Drum Jam on Saturday. Those looking for a more relaxing, yet no less creative, cultural experience took part in the PACE Massive Weekend, which delivered two-full days of workshops, catering for all ages. The taster sessions proved popular, with PACE receiving more than 30 enquiries from local people looking to join the group. The always popular gala days in Johnstone, Erskine and Brookfield Village saw big turn-outs from local communities looking to enjoy a day of family fun. The Dates ‘n’ Mates touring bus was also a hit with a number of new people contacting the team to find out about the range of friendship services, creative workshops and volunteering opportunities which the initiative offers. Scottish and Afro-Caribbean culture was celebrated in Barshaw Park during Paisley’s Diversity Carnival, with the drums, dancing and masquerade going down a storm despite the typically Scottish weather. A record number of people, more than 2,800, pulled on their trainers to take part in the Paisley 2021 Weekend when they completed the Paisley 10k and Fun Run on Sunday. “The number diversity and popularity of the events which took place in Paisley and all over the region exemplify just how strong our cultural offering is. Engaging local communities and encouraging them to become involved in and enjoy cultural activities is a key aim of our Paisley 2021 bid. Paisley’s bid for UK City of Culture 2021aims to transform the town and Renfrewshire’s future by using its unique cultural and heritage offering as the home of the Paisley Pattern and one-time centre of the global textile industry.